I love this little guy (girl?) and the bright red-head. He (she?) is a frequent visitor over the last few days and I have enjoyed this woodpeckers interaction with our other birds. I have been looking out on other’s blogs and we all seem to be having many bird friend visitors recently thanks to the warmer weather. When ever I see a woodpecker I think of the old cartoon about Woody the Woodpecker and his unique laugh. I got a kick out of it. So in honor of that neat old show we will name this woodpecker Woody. I hope he stays around for a while as we do enjoy his company 🙂 Any of you getting any cool birds on your feeders or in your yards recently? Terrific photo. 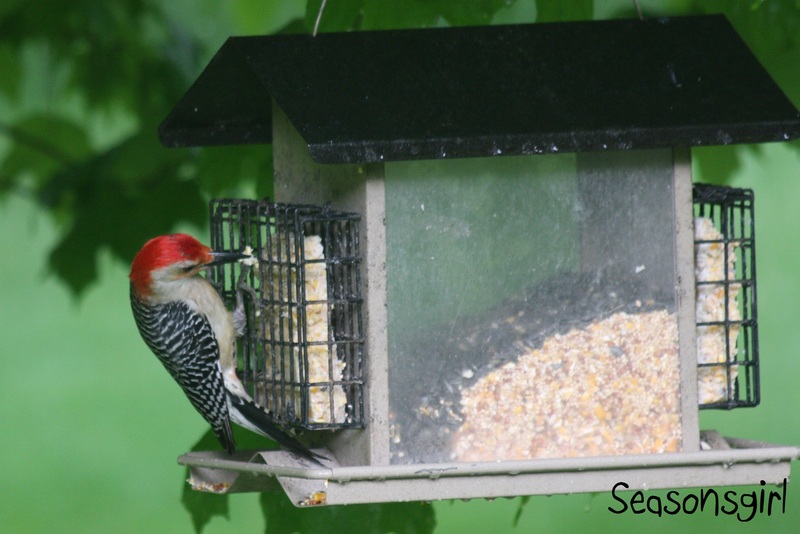 Were you outside when the woodpecker came to the feeding station or is the photo through a window? Love your blog, especially the photos of your dogs. Thanks for re-posting this. We have the pileated woodpecker in our neck of the woods. He has the authentic Woody Woodpecker tuft on his head, but we don’t have the red-headed woodpecker that you show on this photo, so it’s a novelty for me. Love the bird pics. Ohh the pileated woodpecker those are pretty too. If you catch a shot of those let me know. We had one last year but it only stopped by for a day. Hi, just thought you’ld like to know that this is a male red-bellied woodpecker. Nice picture. Awesome picture– we have lots of woodpeckers here, get to hear them but seems I can never catch them long enough to see them. I laughed at my nephew when he bought a set of binoculars with a camera (figured it was for chickies in bikinis) but they might be a good idea, actually. Lovely shots of your birds – lucky things to get them so close to the house.